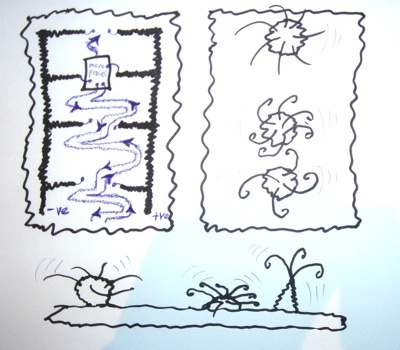 Scruffy is the prototype for a Taxtile, or “actively tactile textile”. Scruffy can feel you stroking and you feel him wag his appendages in response. 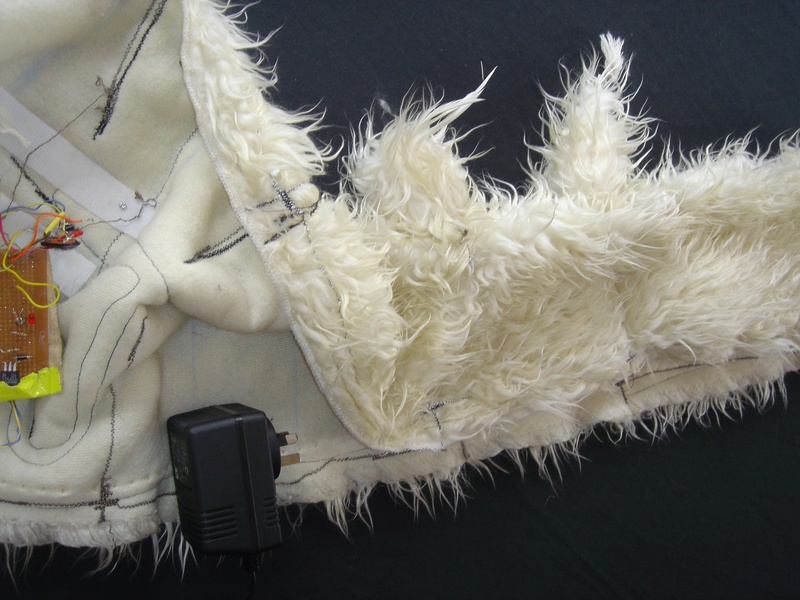 Scruffy consists of a piece of nylon fur sewn with a “nervous system” of conductive thread, connected to a microprocessor “brain” that activates “mechanical” muscles in the appendages. The idea to use fabric as a sensor came about when we observed that stroking ZiZi the Affectionate Couch produced an electrical effect that interfered with the microprocessor when it was placed inside the couch. This glitch was solved by placing the sensitive part inside an insulating metal box. However the effect also raised an interesting possibility that the fabric covering itself could be used to sense ‘stroking’. It turns out that the build up of static charge caused by skin rubbing against nylon is known as the tribo-electric effect. Scruffy is an exploration of the idea that the fabric itself could be a stroke sensor that was developed during the reSkin Workshop on Wearable Technology Arts, organised by the Australian Network on Art and Technology in January 2007. Scruffy demonstrates that the tribo-electric effect can be used to turn the fabric into a soft and washable sensor that envelopes the entire body, opening up new possibilities in mobile IT systems, interactive arts and hi-tech fashion. Scruffy was first shown at the Wearnow Symposium at the National Museum of Australia in February 2007, and was curated by Merryn Gates for Who Let the Dogs Out : The Dog in Contemporary Australian Art at the Lake Maquarie City Gallery Feb-March 2008, and the Hazelhurst Regional Gallery May-June 2008. The development of Scruffy as a prototype of a Taxtile interface was presented in an international peer-reviewed forum at the UbiComp’07 Workshop on Transitive Materials. Barrass S. (2007) Faux Fur Taxtiles: Bridging the Gap Between Cloth and Skin, Workshop on Transitive Materials, International Conference on Ubiquitous Computing, Innsbruck, September 2007.